“It feels really good,” Gesta says, “I’ve been training with Roach.” Roach, of course, is the famed Freddie Roach, trainer of another Filipino fighter, the iconic Manny Pacquiao. Gesta, however, has his own heights to attain. 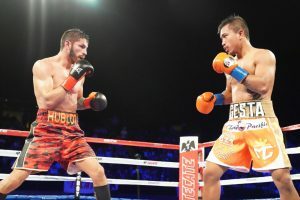 He may have lost his chance of winning the WBA world lightweight title against Linares, but Gesta is far from done hunting belts. “Yes,” he says, when I ask him if he’s still on a title quest. “Of course…I’m still here.” Still, Gesta doesn’t mind if “it takes a couple of more fights” for him to get a another crack at a championship. Right now, Gesta’s attention is zeroed in on Manzanarez. “I can’t just overlook my next opponent,” he says. “I train very hard…every opponent’s different.” Manzanarez looks to be no exception. “I’ve been fighting taller fighters,” says Gesta. Manzanarez may be the same height as Gesta, but according to BoxRec, the man has a nearly 80% KO ratio. What’s more, the Phoenix native has stopped five of his last six opponents within the distance. Should Gesta win and win impressively, the future may indeed look bright. Being part of Oscar De La Hoya’s Golden Boy stable might certainly prove helpful,as well. Gesta claims that membership in De La Hoya’s team “feels great,” and makes it clear De La Hoya himself carries respect. “He was once a fighter,” says Gesta. Such things matter when one is trying to reach the top of the rugged fight game. So does a company that has the pull to help one to the summit. “They are very accommodating,” Gesta says of the promotional outfit that represents him. The main aim is to reward their faith in him.